I paint with a couple old ladies, Candy and Scooter. 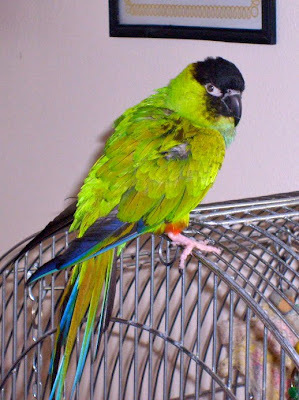 Candy is a Nanday Conure who is extremely needy and loud old lady. She's outgoing and wants to sit on my shoulders anytime I'm home. Besides continually grabbing at brushes, her biggest problem painting with her is that she likes to help (hinder) flocking models. She loves to swim and play in water, so I have to keep the poisonous brush rinsing mug uncomfortably far from myself. 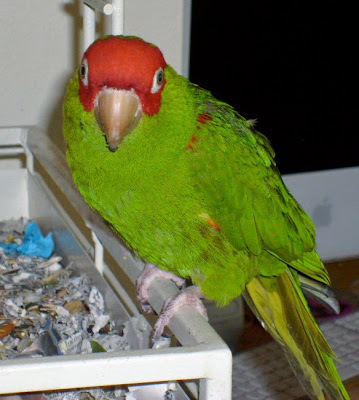 Scooter, a red headed conure, is another old lady who is much more shy. She's not as attention needy with an extreme desire to constantly touch me as Candy, but if you don't ring her little toy bells about once an hour she screeches at the top of her hearing damage causing lungs.